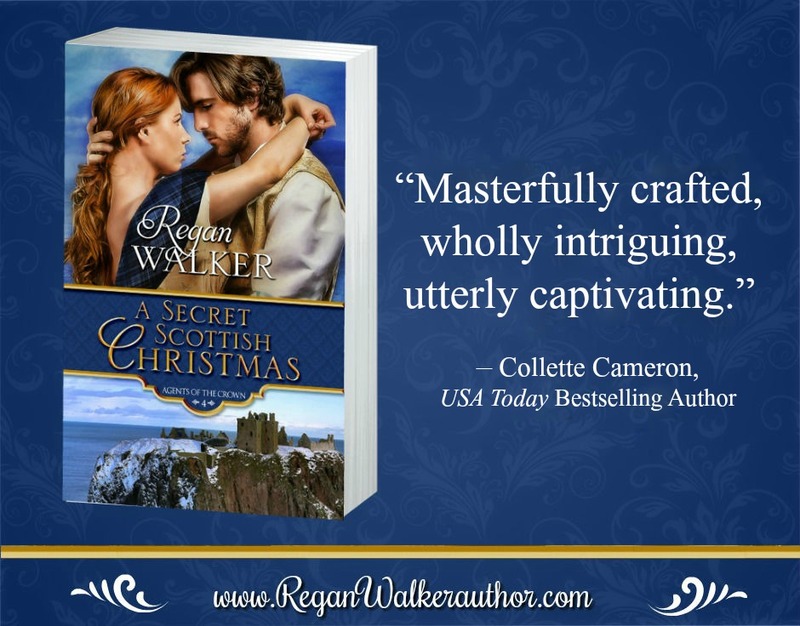 We are absolutely thrilled to be welcoming back the author Regan Walker whose latest book has just been released – A Secret Scottish Christmas and today she’s written a guest blog about orangeries. Whether you call them orangeries, hothouses, greenhouses or conservatories, buildings in which plants were allowed to grow in an environment sheltered from the weather were much in vogue in the 18th and 19th centuries. In the warm air of these glassed buildings, one could grow flowers (oleander, hibiscus, lily of the valley and camellias, among others), vegetables (kale would have been popular in Scotland), oranges and other citrus as well as other fruits (cherries, peaches, plums, pomegranates and figs). Perhaps most favoured of all were the exotic pineapples. The name “orangery” reflects the original use of the building as a place where citrus trees were often wintered in tubs under cover, surviving through harsh frosts and snow, as they do in my story, A Secret Scottish Christmas. It is there the heroine often takes her morning runs. The Romans are credited with the first greenhouses to grow fruits and vegetables, but the Italians are given credit for the orangery during the Renaissance when glassmaking techniques enabled sufficiently large expanses of clear glass to be produced. Though some in Scotland imported citrus trees from Spain, at least one of my sources said it was from Italy the Scots imported small budded orange trees. 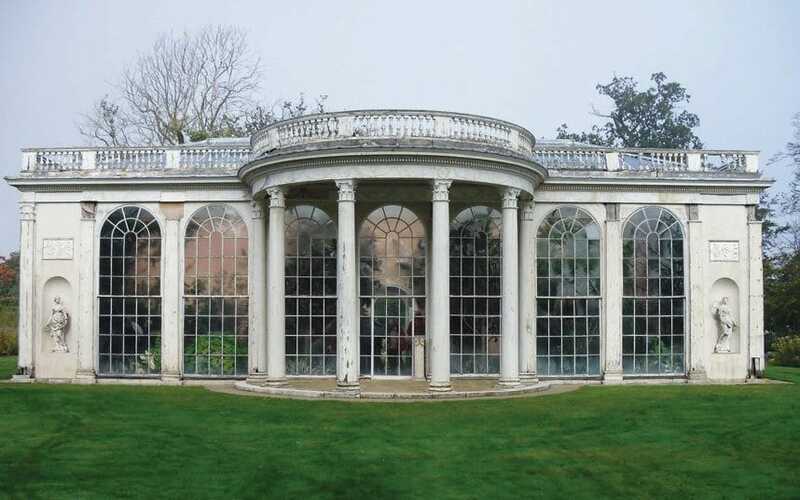 Originally built to protect Queen Anne’s citrus trees from the harmful winter weather, orangeries in Britain became status symbols among the wealthy in Scotland as well as England. 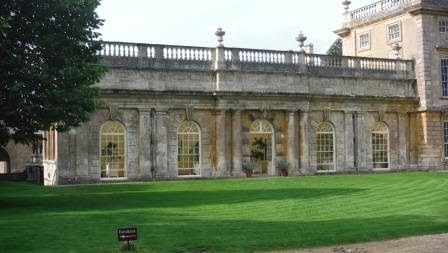 Early orangeries were built as extensions to the house, heated by charcoal braziers. But, as time went on, it became the fashion to have a separate “greenhouse” and, after 1816 when hot water heating came into being, the heating source might be outside the building. Discovered by Christopher Columbus in the Caribbean in 1493, pineapples became a rare delicacy in Europe and were associated with power, wealth, and hospitality. In Britain, the practice of bringing pineapples to the dining table was not just for the aristocracy but extended to the gentry. The list of gentlemen engaged in this horticultural activity includes such notables of Georgian society as the poets William Cowper and Alexander Pope and the architect Lord Burlington. 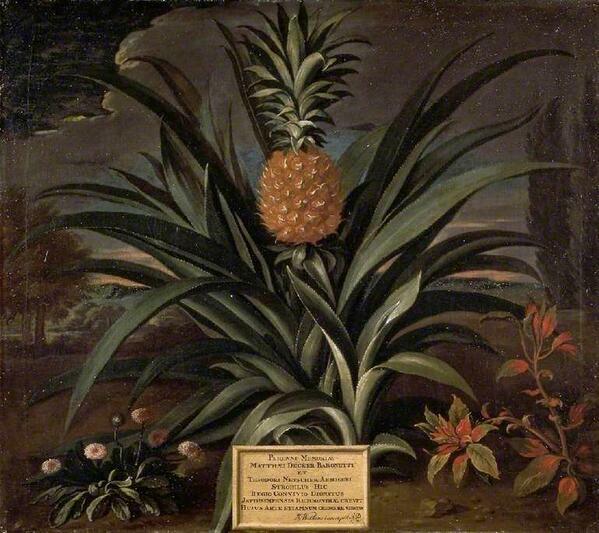 The pineapple was a testament to the owner’s wealth and to his gardener’s skill and experience. Producing a crop of tropical fruit in Scotland before the advent of the hot water heating system in 1816 was a remarkable achievement. Several varieties were grown, but the one most common in Scotland was the Queen pine. 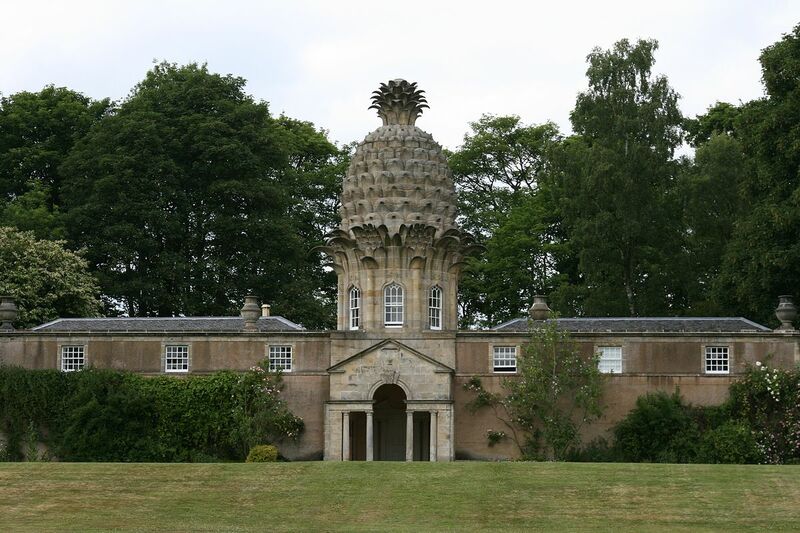 The Dunmore Pineapple, a folly ranked “as the most bizarre building in Scotland”, is located in Stirlingshire, Scotland. Dunmore Park, the ancestral home of the Earls of Dunmore, includes a building containing a hothouse constructed in 1761 by John Murray, 4th Earl of Dunmore. There, among other plants, he grew pineapples. The south-facing ground floor was originally covered with glass windows. The heat was provided by a furnace-driven system that circulated hot air through cavities in the wall. The smoke from the furnace was expelled through four chimneys cleverly disguised as Grecian urns. I have eight of the Ananas in fine fruit. Glasshouse cultivation was an important part of 18th-century horticulture and many of the inventions we now take for granted were developed or refined during this period, such as the use of angled glazing, spirit thermometers and the furnace-heated greenhouses called hothouses. 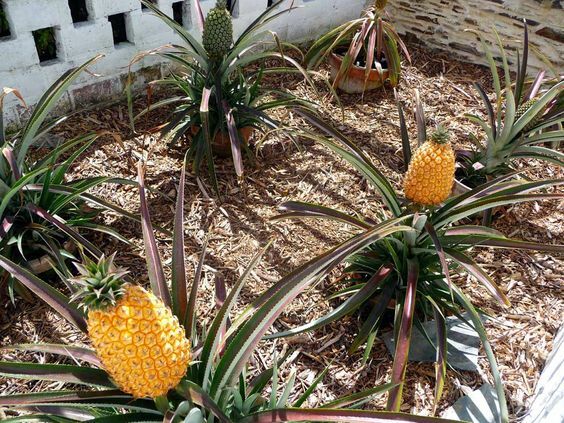 Young pineapple plants were often grown in “tan pits” lined with pebbles at the bottom followed by a layer of manure and then topped with a layer of tanners’ bark into which the pots were plunged. The tanners’ bark, oak bark soaked in water and used in leather tanning, was the most important as it fermented slowly, steadily producing a constant temperature for two to three months. It remained in use until the end of the 19th century. Three developments changed pineapple cultivation: hot water heating in 1816 (allowing the stove and its fumes to be located outside the orangery), sheet glass in 1833, and the abolition of the glass tax in 1845. With these, glasshouses for pineapple cultivation became very large structures. Enjoy your trip through the orangery at the Stephen estate in Arbroath, Scotland in A Secret Scottish Christmas! Thanks, Sarah and Joanne, for having me on your wonderful blog. It’s a delight to share some of my research for A Secret Scottish Christmas with you! I know, Ruby. I, too, would love to see it. Such a magnificent structure, a symbol of an era.